Storytelling and artwork done right. Action adventure games are usually a solo affair. Drop a player into a dark world, give them some swords to swing and some things to upgrade, then let them run around for a few hours before showing an ending. Hooray, you just metroidvaniaed! If you want co-op, though, the genre usually sends you elsewhere. Enter TRISTOY, a short platform adventure game that not only allows for co-op play, it requires it. If you've ever read a Michael Moorcock book, you'll feel right at home in TRISTOY's fantasy world. The setting and backstory aren't filled out with a ton of detail, but what's there is intriguing, and it makes you want to hear more. Prince Freedan and Stayn are imprisoned in Tristoy, a towering dungeon of rock situated in the center of the Sea of Shards. Freedan wants to escape so he can rescue the kidnapped Freya, whereas Stayn wants to escape so he can get his wand back. Different end goals, but since both of them want to escape, they've got the perfect excuse to work together. 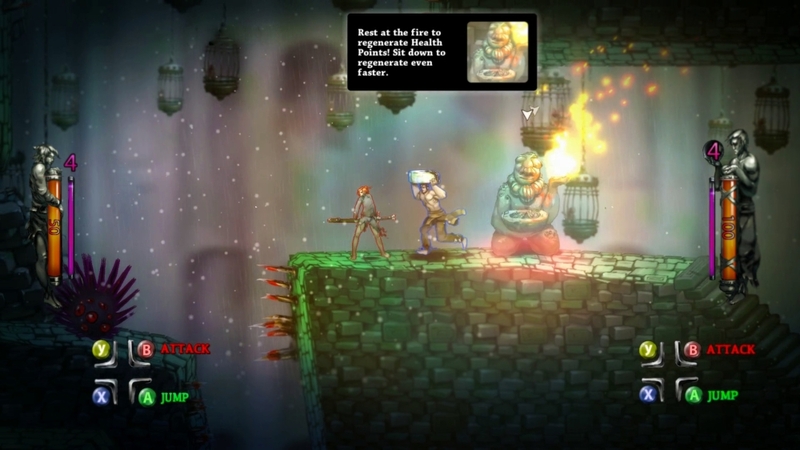 One player controls Freedan, a small, spritely character who wields a sword. The other player gets Stayn, a wizard who uses a stone wheel on a rope like a yo-yo of doom. Each character's abilities let them do certain tasks better than the other. Freedan can double jump, for example, but his sword can't take out enemies like Stayn's wheel can. Stayn also has his gyromantic skill that lets him manipulate certain pieces of machinery. It sets up a very natural atmosphere for cooperation. Freedan and Stayn strut through a few dozen short levels that connect on a world map. There isn't much in the way of backtracking, branching paths or exploration, so you'll spend most of your time pushing through stages before pausing for an intense boss battle. Puzzles are generally limited to finding the right button to stand on. 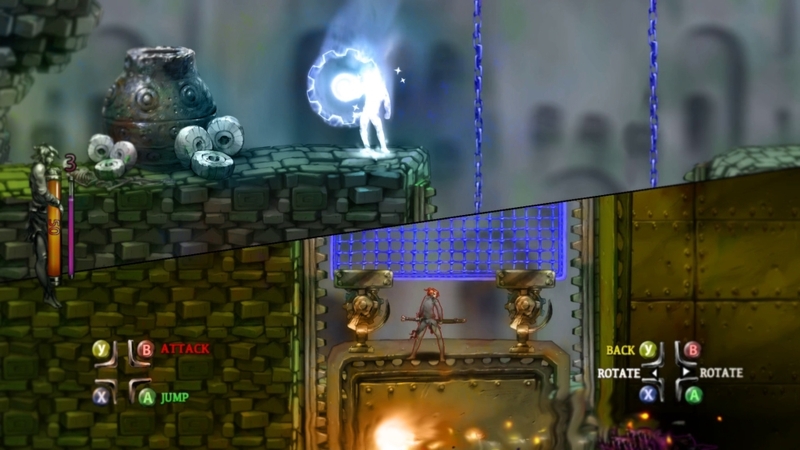 Sometimes the characters will need to split up and stand on separate switches at the same time in order to proceed. Really, though, you won't break your brain puzzling through TRISTOY. You might break your controller, but that's a tale for the second page of the review. Storytelling is one of TRISTOY's strongest features, not only because the world is interesting, but also because you have so much control over conversations. Freedan and Stayn encounter NPCs and speak to each other quite often, giving us ample opportunity to indulge in multi-choice dialogue. Options pop up for each character during conversations, allowing players to push the narrative in slightly different directions. The choices you make affect how characters feel and act towards each other at the end of the game. Notes like "Stayn will remember this" send a little chill down your spine, especially when you just made Freedan be a total jerk towards him. The whole thing culminates in a multitude of different endings, giving TRISTOY a touch of replay value. Co-op works well in TRISTOY, which is good since there's literally no other way to play. Stayn and Freedan move independently of each other but still have to work together in order to proceed. This is facilitated by the game's unique dynamic splitscreen. Instead of chopping the screen in half every time the characters part ways, tilts and rotates the divide depending on where the characters are and what they're doing. It's a little disorienting when each player stares at a separate part of the same level-wide event, but it makes exploration a lot easier in the long run. Page created in 1.3047 seconds.